About this time last year, Katie and I flew off to London for the weekend to take in some theater, a London Fashion Weekend show, some good food, some history, and a shot of urban living. Our second night in London required a strong drink to make me forget how I’d embarrassed myself on our first night in London. Katie wanted to go to a rooftop restaurant or bar and soak up a little urban chic. Good plan. But the chicest of the chic would have required reservations much in advance, so we looked for “in and out” bars that would fit the bill. One popped up with potential, and in an area of the city that we know well and has some great views. 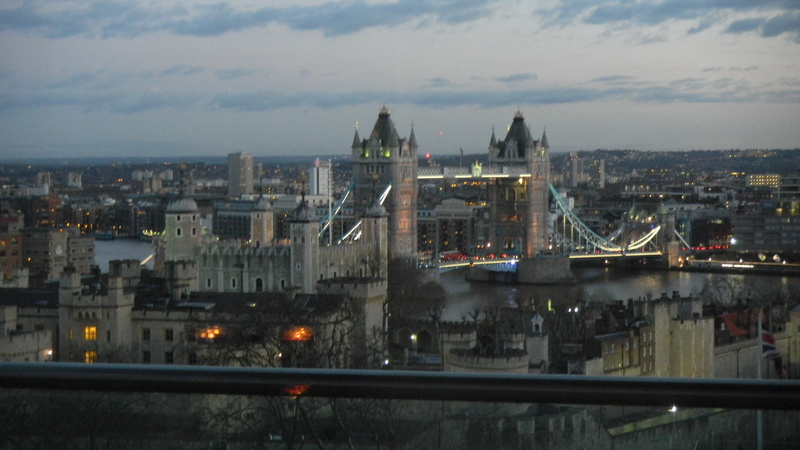 The rooftop bar at the Hilton Doubletree by the Tower of London. It fit the bill well. The bar itself was chic enough, if not ultra swanky. The drinks and desserts we ordered while oogling the view were spot on– I went for a Moscow Mule, my favorite go-to, and something cheesecake derived (fuzzy memory, but I remember that the presentation was great). We sat inside (it being February), but there is a very large and lovely outdoor terrace too, if you find yourself in London during warmer months. The view as the sun dropped low and disappeared altogether was stunning. I did feel urban, and I did feel chic, as I sipped my Moscow Mule and looked out over the hustle and bustle of London. So much energy and atmosphere rolling out in the streets below and all along the Thames. First, it’s the urban energy and the architectural artistry that quickens your pulse. But then . . . well, maybe it’s my wistful nature, or maybe it was the Moscow Mule, but I think maybe it’s a universal truth that you look out over a scene like this and you find yourself not just overlooking geography, but gazing at history rolled out before you like a red carpet just begging you to walk it. If your gaze slides just west of the Tower and down the Thames, you’ll be strolling into Southwark. Into the history of Shakespeare’s Globe Theater, past The George Inn, the oldest (or only) galleried Georgian pub remaining in London, and a favorite drinking spot of the ever-thirsty Charles Dickens. Here, if you are terribly bookish, or prone to the seductive ambiguity of twilight, or more than one Moscow Mule into the night (which I wasn’t), you might get so caught up in the teaming past-life of the London streets you are over-looking (that you might have, in a less wistful mood, entirely overlooked), in their teaming vapors of past-present-literary lives that, each and every one, ask to be explored and understood– well, you might just never re-emerge. But we did. We drank in the view and wondered at the lights and lives we peered out over, if not into. Then we left our towering view above the Tower. We emerged energized, awe-spired, and feeling rather chic and smart. We emerged ready to tackle more of what our fabulous friend London could throw at us. If only it had given me one more chance at making a good impression on Matthew Perry. What? Is this possible? You know I have a thing for stretchy Turkish ice cream– if you were paying attention, I sang its praises last fall in a blog post called “How We Eat . . .”. You can imagine Mr. Sam Worley’s article quickened my pulse more than a little. It has arrived on my shores! Turkish Dondurma! I squealed, I celebrated! But then I wondered. Can I eat Turkish dondurma from the local grocery aisle, or would it be wrong, and certainly disappointing, to pull it from my upright freezer in my air conditioned Floridian home and eat it with a spoon and dish in my breakfast nook? Would it betray every memory I have of sassy dondurma sellers in Istanbul or on the Turkish Mediterranean, paddling out the stretchy treat, only to whip it out of your grasp at the last moment. . . only to finally relent and offer up the treat, which I would greedily gobble before it (or I) melted into the hot walkway of a Turkish summer day. Would my favorite sweet Turkish treat suffer if it wasn’t fresh, and if everything about its presentation and circumstances was decidedly un-Turkish? Decidedly mundane. Bought at the local grocer. Still, you know I’ll look for it in the stores. Maybe I’ll purchase some. I hope it will be delicious. It’ll certainly be a treat and a novelty . . . but scooped from a store carton it will be an anemic facsimile. I’d rather enjoy it by the Sea of Marmara or the Mediterranean– who wouldn’t? I’ll leave you with the blurb from Epicurious (which includes a fantastic video of an impish Turkish ice cream man at work), as well as my original post on Turkish ice cream. We can’t wait to try the famously elastic dessert. Behold the pictures, all over the internet, of street vendors stretching Turkish ice cream just like it’s boardwalk taffy. That’s maraş dondurma, a confection made not just with milk and sugar but with mastic, a tree resin, and salep, the roots of wild mountain orchids, which imparts elasticity. The best and frankly only way to describe this is as stretchy, chewy ice cream. Word on the street is that people have been photographed jumping rope with it; others have cut it with knives and chainsaws. On the street, too—or in the markets, rather, where you get this ice cream in Istanbul—its unique stretchiness enables vendors to play all manner of practical jokes with would-be ice cream eaters, as in the video below. The metal rod you see there is part of the traditional production process: the ice cream is beaten—kneaded, more or less—so that it sticks to itself. What results is a frozen confectionyou can do some tricks with; it’s also quite a bit slower to melt than non-elastic ice cream, a boon in the Turkish summers. Something like dondurma is now available in the U.S., but in grocery aisles rather than bazaars. Lezzetli Mediterranean Ice Cream, which has been selling in the New York area for a while, announced today that it’s expanding its distribution throughout the northeastern United States, with four flagship flavors: Chios vanilla, made with a Greek tree sap; chocolate–orange blossom; spiced date, and tart cherry. Lezzetli bills its ice creams as inspired by similar desserts of Turkey and the Levant—versions of dondurma also exist in places like Syria and Greece—and they aren’t thickened with orchids, which are endangered, but with other natural gums. (In Turkey, for this same reason, salep has given way to other thickeners, like guar gum.) Not in your local place yet? Request it! Your grocer might be pliable. The title is a mouthful: a delicious, caloric mouthful. Inspired by a delicious and caloric, if somewhat stressful, week of cakes and puddings at our house. An actual storm is sitting out in the Gulf, on our doorstep, and making vague threats, while the figurative storm of finding your bearings in a new environment is battering us around quite handily. Under the circumstances, why not fatten our bodies and spirits for the fight, right? Cakes and Ale is a fine battle strategy, I say. Anyhoo, on with the post. . . When I was young, my mother used to sing a song that would make us giggle and make us hungry at the same time: “Shoofly Pie and Apple Pan Dowdy, make your eyes light up and your tummy say ‘howdy.’” Silly. I’ve never had Apple Pan Dowdy, but I can imagine the cobbler-like creation with no problem. Shoofly Pie is harder to conjure. Obviously sweet and sticky– a fly magnet (yuck! )– but the closest thing I can picture is a chess pie, and I don’t think that’s exactly right. Which brings me to stretchy ice cream. What, you’ll ask, is that? A Floridian taffy-ice cream hybrid? An over-cooked custard that makes a chewy ice cream? No and no. I’m thinking of Turkish Dondurma– an ice cream made with wild orchid extracts and salep ( a milky Turkish drink containing orchids). Dondurma doesn’t taste of orchids, it comes in many flavors. My favorite was banana. I only discovered dondurma toward the end of our life in Turkey, which is a shame because it is silky and delicious . . . and stretchy. That doesn’t really affect the taste, but it makes for a great parlor trick. Dondurma is often served in a dramatic way, dished out with a paddle and wrapped around your cone, only to be pulled back at the last moment. The Turks love a laugh and good food, so why not marry the two? I’ve been thinking about Dondurma lately. 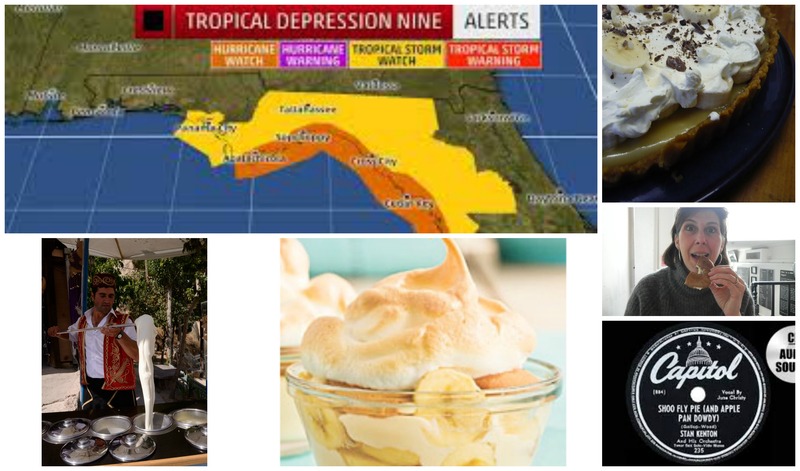 August in Florida will bring out all of your ice cream fantasies, believe me. But this week, I’m remembering Banana Dondurma while making a traditional Banana Pudding for my children. A REAL Banana Pudding– no instant pudding and cool whip. Ugh. A silky homemade custard is the only way to go, people. My mother made this Banana Pudding for us growing up, and I’m pretty sure that her mother made it too. I’m printing the recipe at the end of this post. It’s simple and satisfying, and I like it best when it’s still a tad warm (but I know people who only like it cold, so this is clearly a matter of personal taste). Photo from myrecipes.com–sadly we ate into our pudding too quickly to get a good photo! 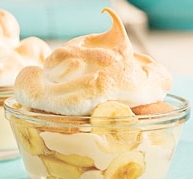 Banana Pudding is a staple of the American South, a time-tested comfort food, welcome around any pot luck or picnic table. Why is it Southern? I have no idea. It goes well with bourbon? (There are worse theories.) If you want a primer on the treat and its history, I’d suggest you read the article posted on the SeriousEats website– an interesting and remarkably in-depth read. If you’re here for the yummy, not the history, feel free to skip the article, fast forward to my recipe, and judge for yourself. But not before you consider Banoffee Pie. It deserves a mention in a travel and culture blog, because what Banana Pudding is to the American South, Banoffee Pie seems to be to Brits. A perfect comfort food, a sweet banana dessert that pops up everywhere. “Banoffee” you say? Yes– bananas, cream, and toffee. BAN. OFFEE. Although it’s a British staple, it’s not one of those long-standing English recipes that dates back to the middle ages (think mincemeat pie). No– bananas weren’t easy to come by before modern times. Still, you find it in so many homes, on so many menus, and in endless incarnations these days. Nigella Lawson has a great looking Banoffee Cheesecake recipe, as well a Chocolate Banoffee recipe. There are Banoffee sundaes and cupcakes and pastries. 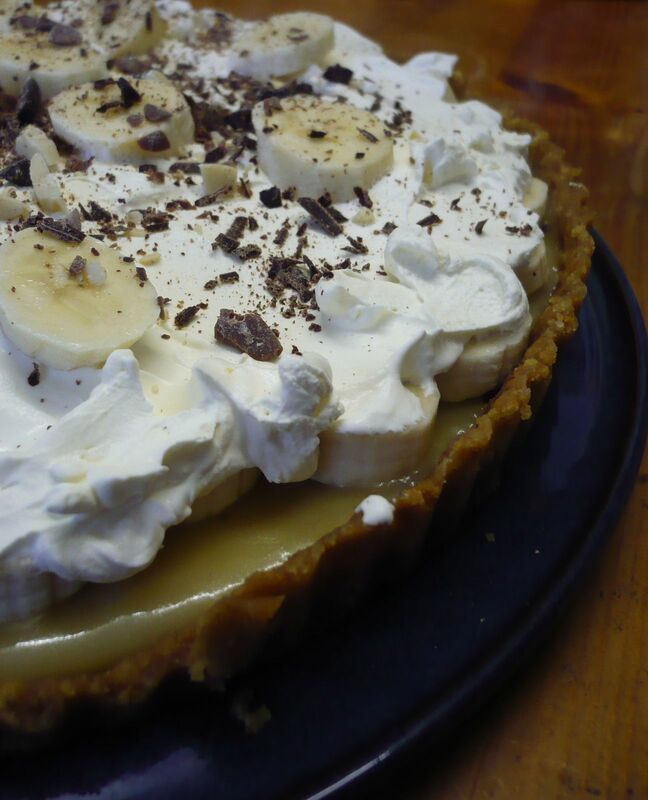 If you can think up a twist to banoffee pie, it’s out there. I have nibbled at Banoffee creations, but haven’t perfected my own version, so I’ll encourage you to find your own recipe. If you already have the perfect recipe, feel free to share it with me! I’ll leave you with my pudding recipe and a final thought on comfort food. On how we eat. I love sugar, and I love rich puddings, and I love sharing these things with family. But it’s not just the yumminess, and it’s not just the hospitality, it is the comfort that gets me this week– the ritual of sharing this favorite family recipe. 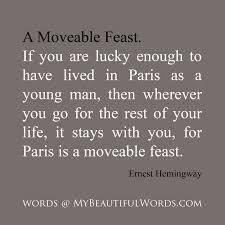 Hemingway spoke of Paris as a moveable feast–a joy and light and influence, a wealth of experiences–that stays with you wherever you go. Whether or not we have Paris, we all have a storehouse of moveable feasts. This week, Banana Pudding is my moveable feast. The world is spinning a bit fast for me, the Gulf is churning a bit violently, but I have my pudding (a tad warm yet) and I have my children with their spoons at the ready . . . and I find that I have a feast of friends around this table — I have my grandmother’s cooking, my mother’s singing, my Turkish ice cream man, and my British bakery, and I sit in the company of these fine things and dig in to my bowl, and I know, with a quiet conviction, that the world will be right soon enough. For the custard: 1/2 cup sugar, 3 Tablespoons flour, dash of salt, 1 whole egg, 3 egg yolks (save the whites), 2 cups of milk. Layer vanilla wafers and banana slices; pour some custard over the top; then repeat these layers. For meringue topping: beat the 3 egg whites, gradually adding up to 1/4 cup of sugar (and 1/4 teaspoon cream of tartar, if you wish). Bake this until browned (at 400 degrees, or using the broiler). Our first visit to a Candlemas service took place in 2005 or 2006. Our children were very young, and we took them in their pajamas (it was a cold mid-winter’s night, they were young, we saw no need to stand on ceremony). 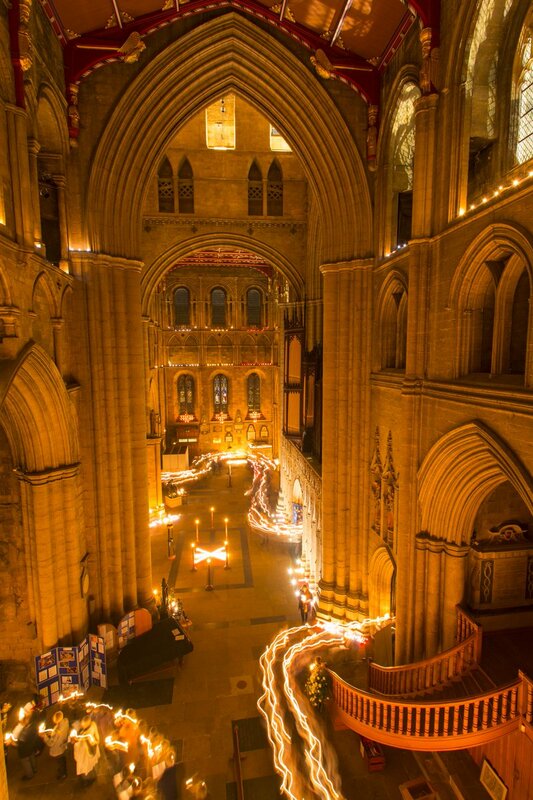 Our friend, a canon at the cathedral, had called us at the last minute and said, “You really ought to see this, it’s beautiful and will be a new experience for you.” We’d imagined that we’d just pop our heads in, satisfy a curiosity, and leave quickly to get the children into bed. But, like Homer’s lotus eaters, we stepped into the space and it was such a fantastic and pleasurable experience that we forgot to leave! We stayed for the procession, we moved dreamily through the ancient, light-filled space and, although I’d like to tell you just how it felt and how it lifted our spirits, my words fall short. To be in that ancient space, with the thousands of candles at once warming, lighting, and dancing along the walls (seeming, in their dancing flames, to sing and process along with the parishioners), to move through that space with a sea of people (young and old, high and low, well-dressed and pajama-ed)– this was so moving and uplifting. This morning, I’m starting my day off in sunny Florida. It is no bleak mid-winter day outside. The light never really left us this winter–certainly not by northern or European measures. But the need for a turning and a renewal is as strong as ever. Tonight, I will put on my cozy pajamas, I will light some candles at home, and I will drift off to Ripon Cathedral, lotus-eater like. I will process through the nave and side aisle, pause by niches, hold my young children tight, marvel at the warmth and the glow and the sea of my fellow revelers. I’ll be there. Not even the great expanse of the Atlantic Ocean could keep me away.